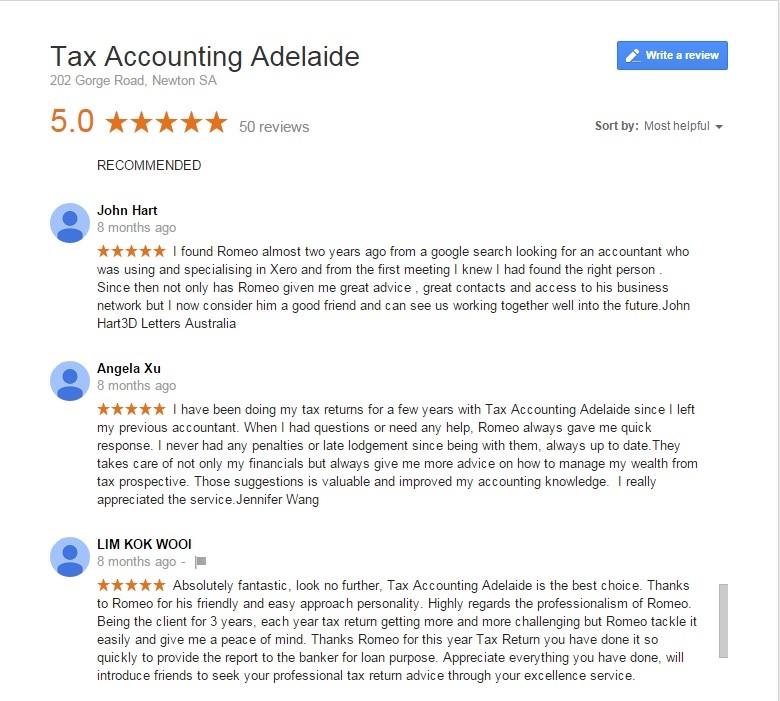 Romeo was recommended to me by a friend a year ago when I mentioned I needed to have my tax return completed. I phoned Romeo and was granted an appointment within the same week which was great. My husband and I then headed to Romeo's office, armed with all our receipts and Income reports etc. We were welcomed by Romeo and promptly started to sort through all our paperwork all the while asking questions. 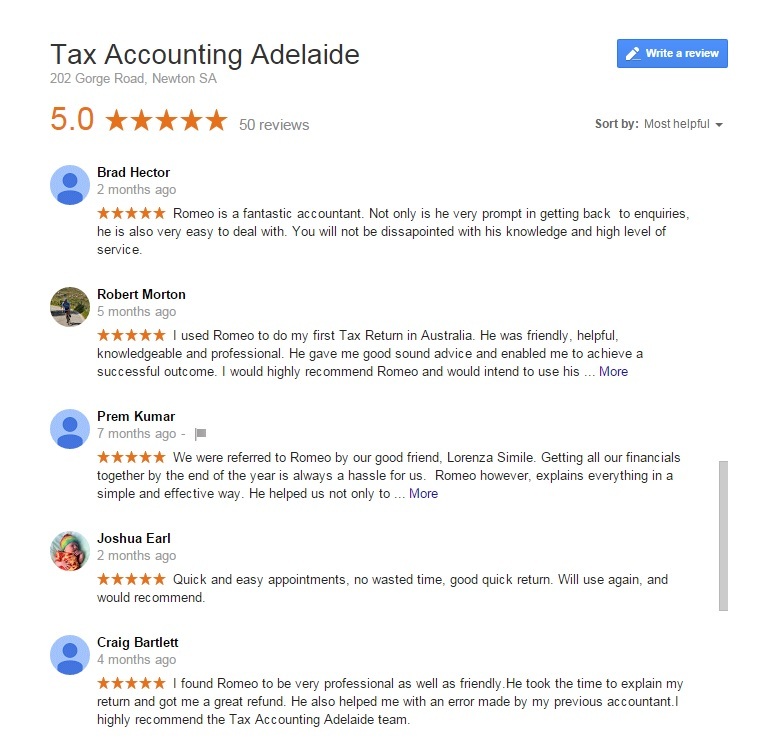 After years and years of having my tax return completed by an uninterested accountant, I was completely floored at Romeo's professionalism. 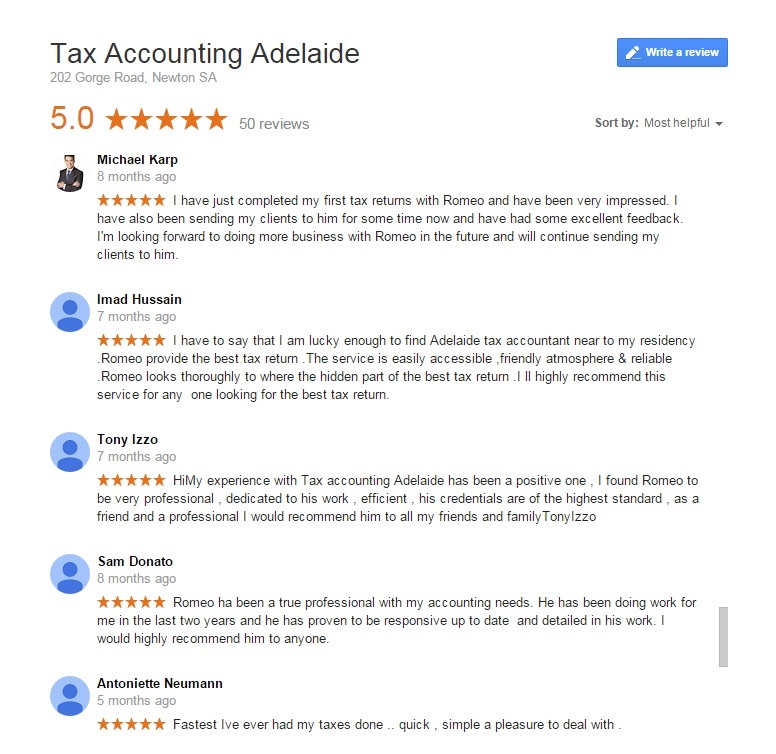 Whilst assisting us with our tax returns, he also told us about more deductions to collate for the next year, and what receipts and logs to complete with our particular job roles. 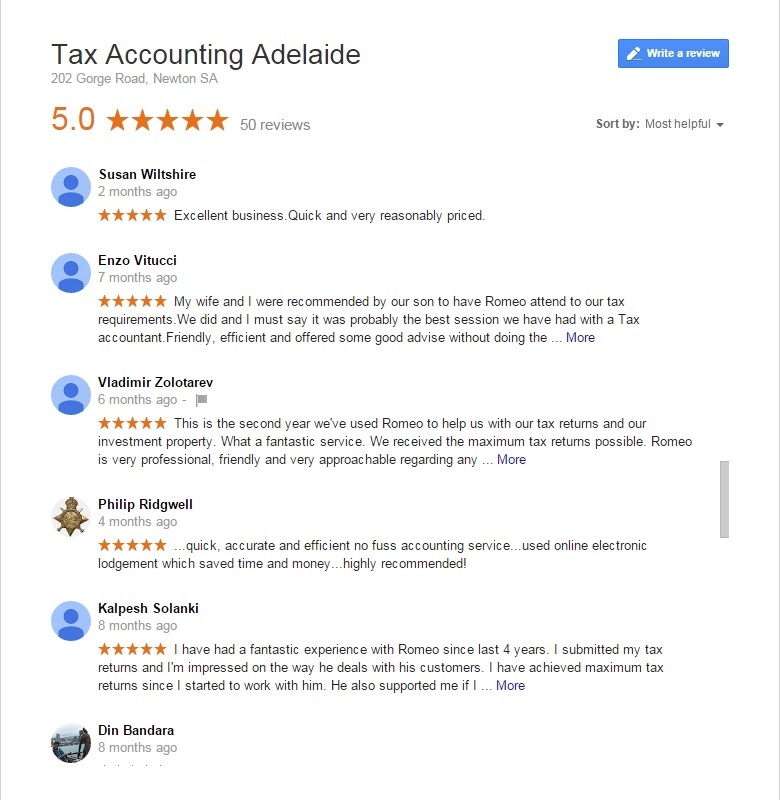 Thank you for all your help Romeo, I look forward to tax time next year !! Romeo now prepares and lodges my BAS returns and is always acessable, accurate and reliable. He is a nice person and great business mind to talk to. He converted my business to gst registered and since my acupuncture services are gst free, this has saved me money by recouping all GST paid. My previous accountant let this slip by. 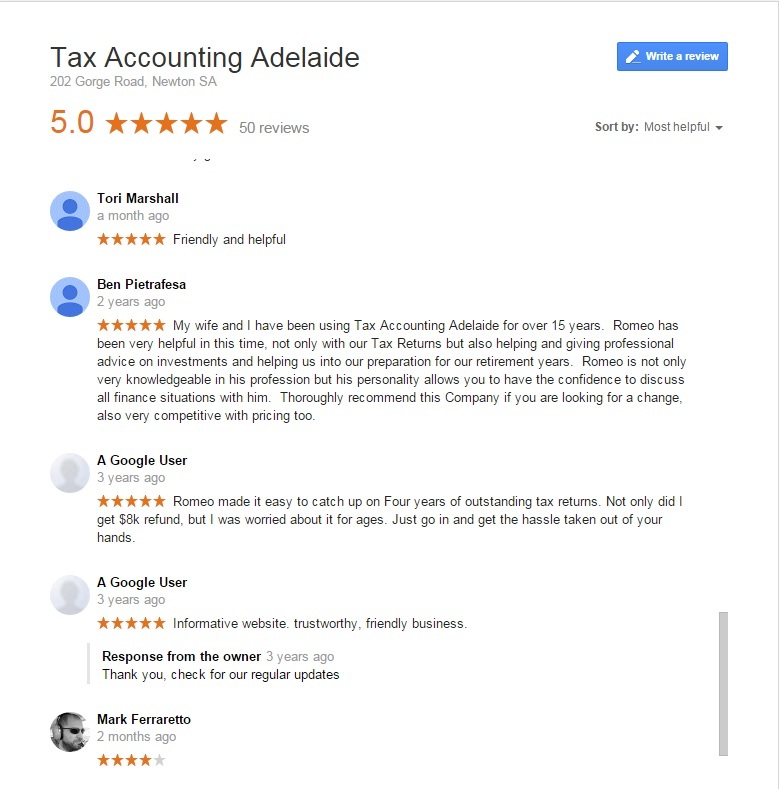 I thoroughly recommend his services as accountant and business coach. 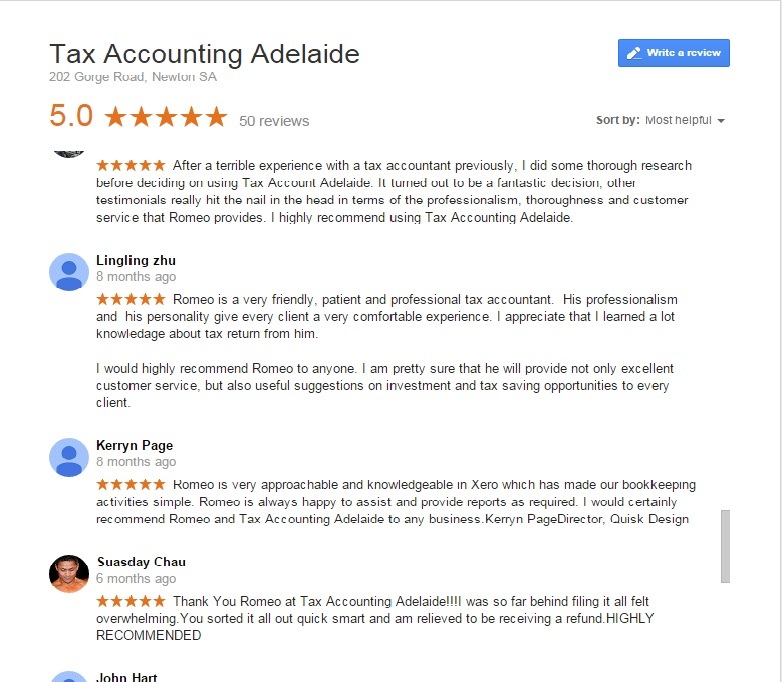 I would highly recommend Romeo Caproaso of Tax Accounting Adelaide. He is my accountant and he is a master !..... accurate efficient and willing to help people at the place they need it . I know the frustration of having a poor accountant so I have become very fussy and specific about what I need . 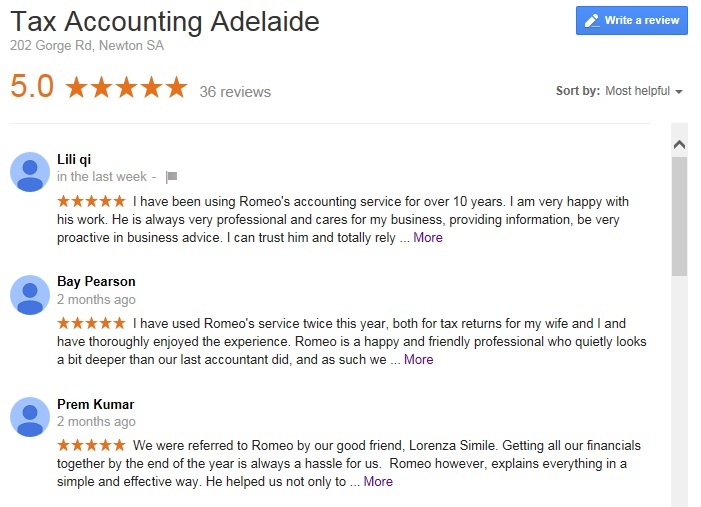 Romeo has proven to be service oriented and client focused . Give him a ring on 8337460 for choosing the right business partner for you. 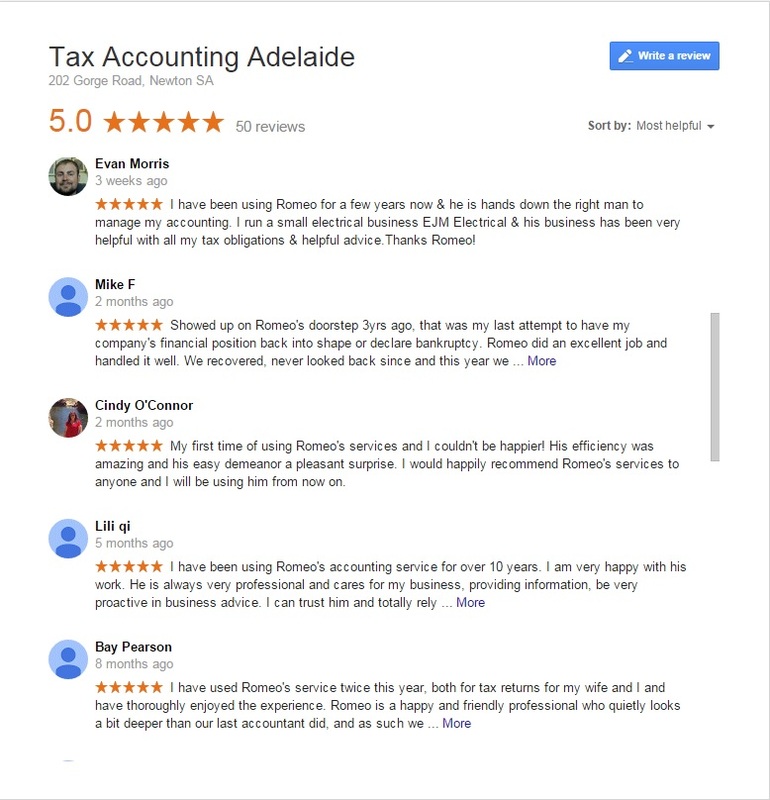 Romeo has been reliable and keeps us on top of our BAS and accounting requirements. He is also a valuable source of advice for the business' past, present and future. We used to find it hard to organise our family finances and investment portfolio. 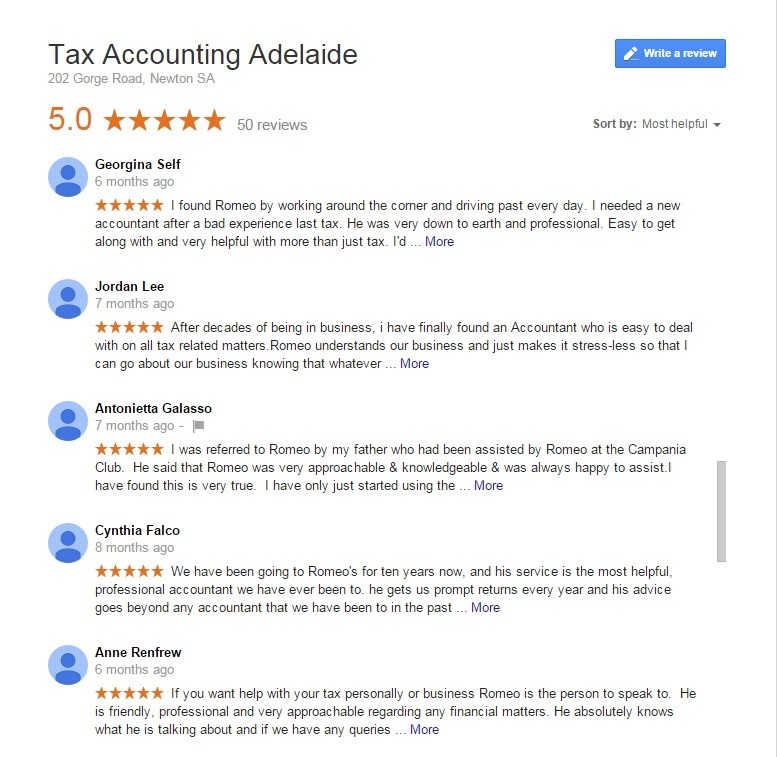 But now with Romeo's unique Life accounting, we have financials which provides me information for the tax returns as well as seeing where all our money comes in and goes out. He is amazingly entrprenurial. It is great to feed off of his great ideas in property and internet business. Romeo Caporaso was employed by the Karidis Corporation Limited from March 2007 until August 2008. He performed the role of Business Consultant and was involved in tasks such as quarterly BAS returns, multi entity company accounting and reporting. We are a diverse organization involved in Retirement Village development, Apartment buildings and operations, Car Parks and commercial property leasing. Romeo became involved in all areas of our operations and was instrumental in establishing systems, documentation and accounting procedures we continue to utilise daily. P&O Petsios is a large hydroponic tomato growing producer based in Virginia SA. 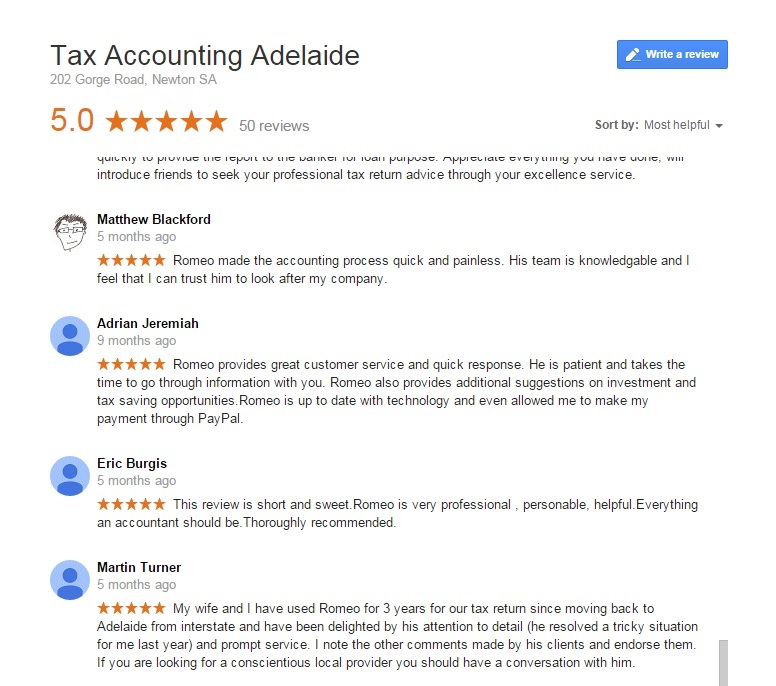 Romeo has been our accountant for over three years. He has helped our business grow and we are able to focus on our production and management of our business. 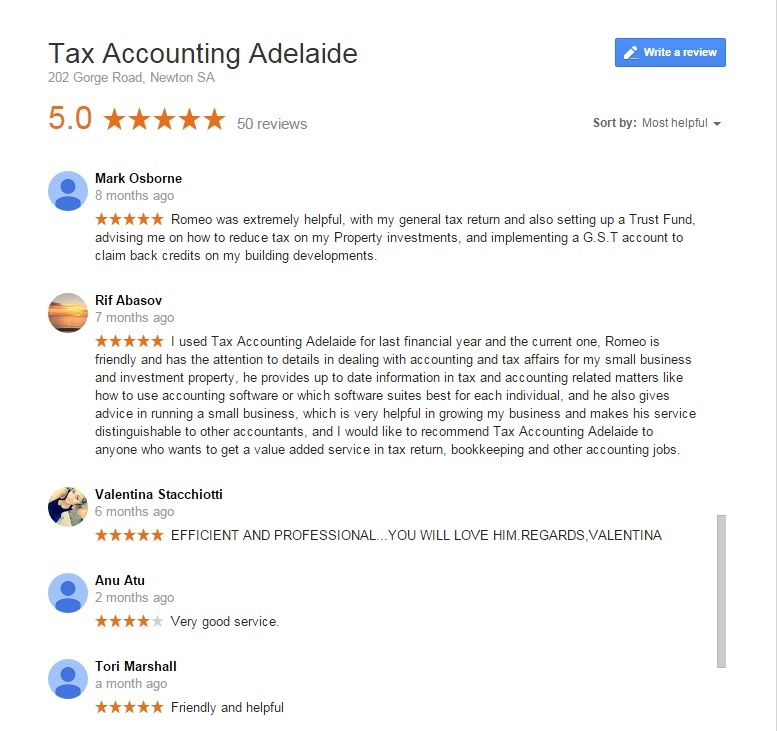 During that time we have progressed from a basic accounting package into a systematic monthly reporting accounting using MYOB and our uniquely developed management reports, which provide us up to date information on all sales and production costing and output. He is also prompt on our BAS returns which assists our cash flow as our supplies are GST free. He is able to provide all round practical business help and mentors us through many financial decisions from tax, capital investments to employees. Romeo is always available and has been able to sort it all out for us. 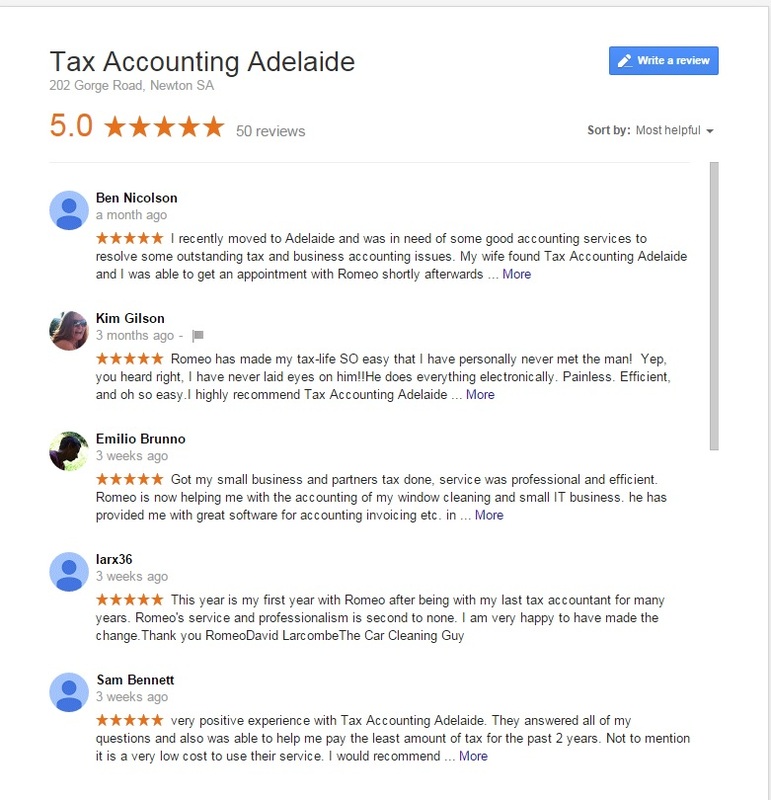 We would highly recommend his accounting and business services.